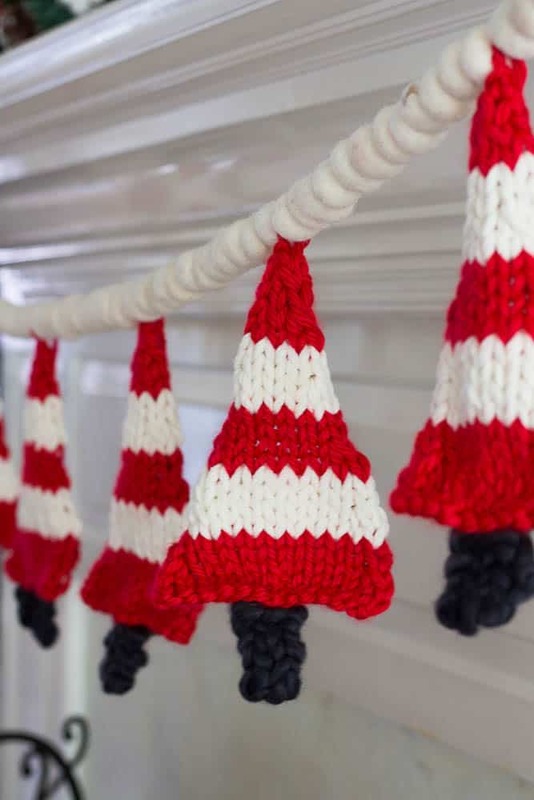 This adorable Knitted Christmas Tree Banner is quick and easy to knit. 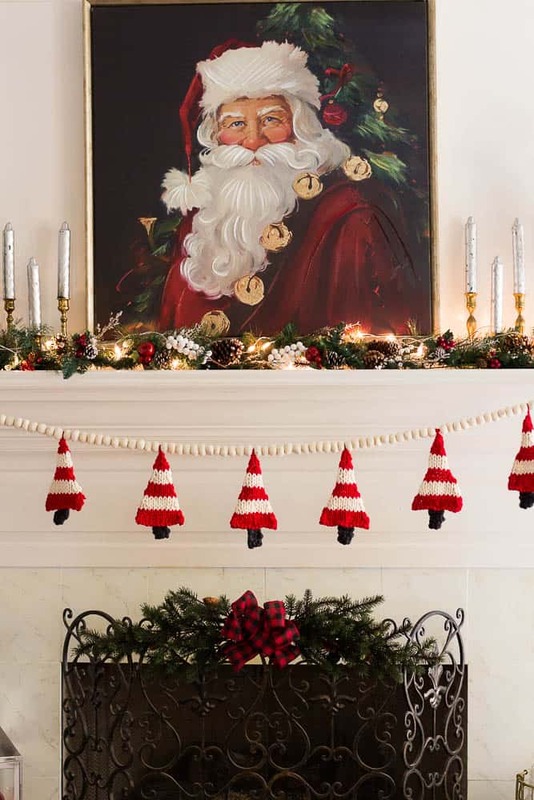 This banner looks beautiful draped across a mantel and brings the colors of Christmas into your home. 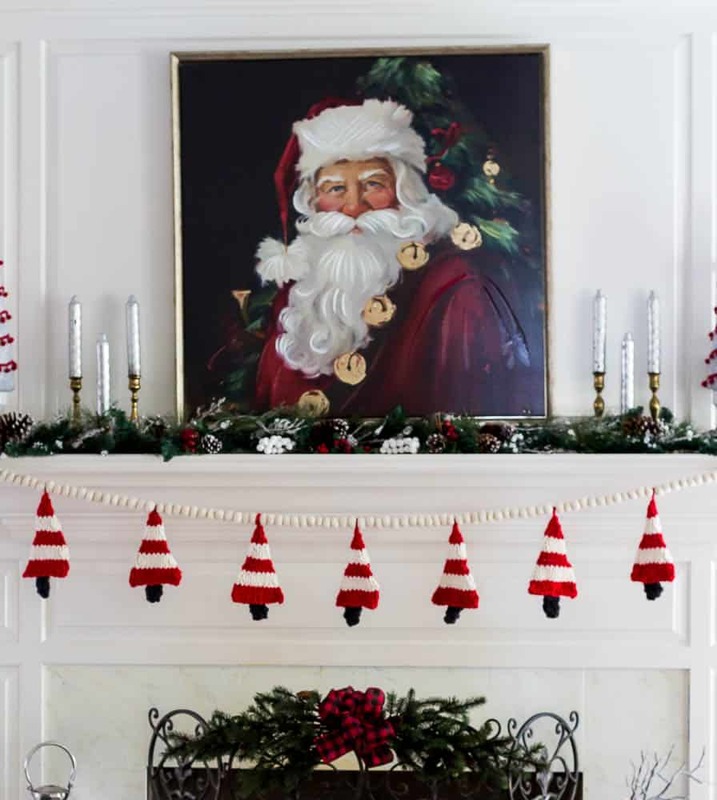 I love all the beautiful metallic colors and all the soft colors that are used in Christmas decor but I have to be honest, I really love the old traditional bright red, greens, and whites in my home. I remember growing up and how much my mother loved Christmas. She would make decorating the tree and also our home, very special. After we decorated the tree, we would make homemade divinity. Our divinity always failed so we would laugh and eat the divinity with a spoon. We still ask her to make us a bowl of failed divinity every year. It was still delicious even if it didn’t look perfect. I remember how excited I would get when I pulled all of the ornaments out of the boxes. It brought back memories of all of our past Christmases. I have always wanted my children to have the same experience. I don’t know why but they do not act that excited about using the same ornaments every year. I guess things are different these days but I still want to use the same traditional colors that we had in our home every year. I do love that people are bringing back the vintage decor this Christmas. While shopping, I saw some little knitted Christmas tree ornaments and I was inspired to make something similar to use as a garland for the fireplace. I played around with some patterns until I had adapted a pattern to make the trees large enough for a banner. These trees are easy to knit and can be knitted very quickly. I tied the trees to a felted ball garland but you could use rope, twine, or ribbon if you desire. I sewed a craft stick to the bottom of the tree so that my knitted trees would stay open and not curl. Chunky yarn in the colors you choose. 2 colors for striped tree and 1 color for tree trunk. I am sharing the pattern for a striped tree. Cast on 14 stitches in color A (red). Row 3 K1. ssk. Knit to last 3 sts. K2tog. K1 – You will have 12 stitches now. Row 7 K1. ssk. Knit to last 3 sts. K2tog. K1 -You will have 10 stitches. Row 11 K1. ssk. Knit to last 3 sts. K2tog. K1 -You will have 8 stitches. Row 21 K 2tog. Knit 2 tog. Cut yarn leaving at least 6-inch tail and pull through remaining 2 stitches. Tie in a knot. Cast on 3 stitches (or more if you want a wider trunk) and knit 5 rows. Cast off. Sew the trunk to the tree. This is so doggone wonderful, Sherry. I have no knitting experience at all so I’m not even sure what your directions mean but you are convincing me that this is a great skill to learn. This is adorable. Love it. Pinning! This is so precious. I am a traditionalist when it comes to decorating for Christmas. The designer trees are lovely but I love the ones with ornaments that have been collected over time. Your garland is a lovely keepsake. I will have to put it on my must-try list. Pinned. SHERRY!!!! 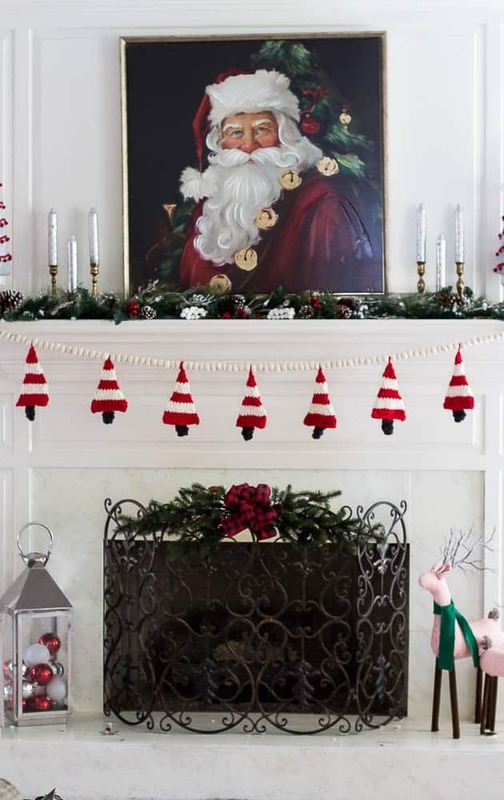 I love this garland! And I’m with you about the traditional colors. These are so fun and so easy to make…thanks for the great idea my friend. Pinning right now! I like the traditional reds & greens too. Love the banner & cute red & white knitted trees. 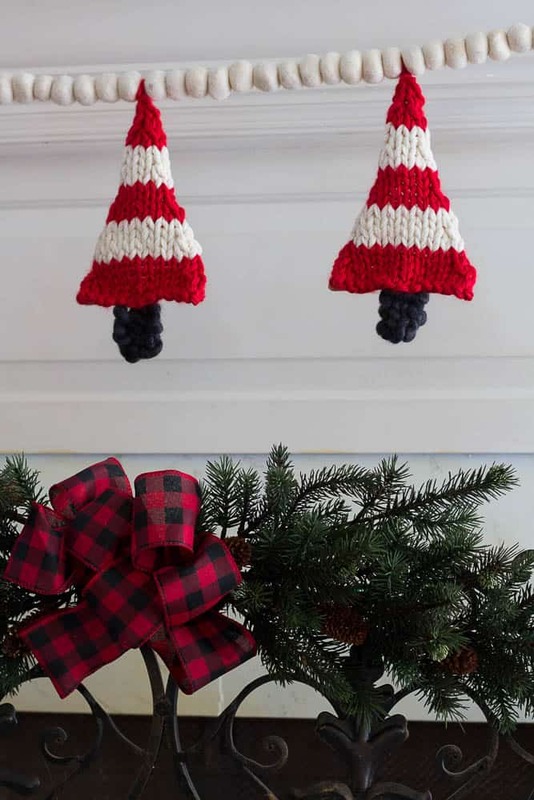 Hi Sherry, I love the simplicity of this tree garland and can’t wait to make my own . So sweet. This is so precious. I cannot knit but I certainly appreciate the beauty of it. That is the cutest! Thank you for sharing at The Really Crafty Link Party. Pinned! So cute. Wish I could do this. Pinning anyway. Sherry, love that you rekindle Christmas traditions from your childhood. I am passing your garland directions on to one of my knitter friends. Can you tell me where you found that amazing Santa picture? It’s gorgeous!!!! Happy holidays to you and yours! Hi! 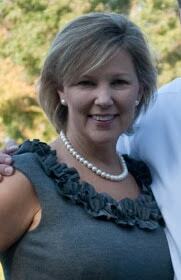 I am Sherry and I live in Alabama. Thanks for visiting my blog. I love beautiful things but I am passionate about decorating my home without going in debt. It is amazing how creative you can be when you are on a budget. My home is decorated with diy projects, thrift store finds, and some items purchased new. I hope that you find something you to create for your home.